The illustration above, from the September 1869 issue of Harper’s New Monthly Magazine (p. 470), was based on a photograph by Timothy H. O’Sullivan, with the 1867 King Survey of the U.S.G.S.Â At the time, photographs couldn’t be printed in magazines, so an artist’s rendition in the form of an etching was used. 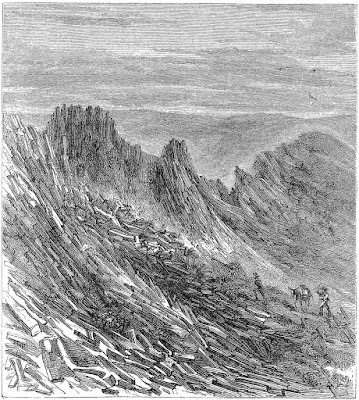 The etching was reprinted in Silent Cordilleras: The Mountain Ranges of Nevada by Alvin R. McLane (Camp Nevada Monograph No. 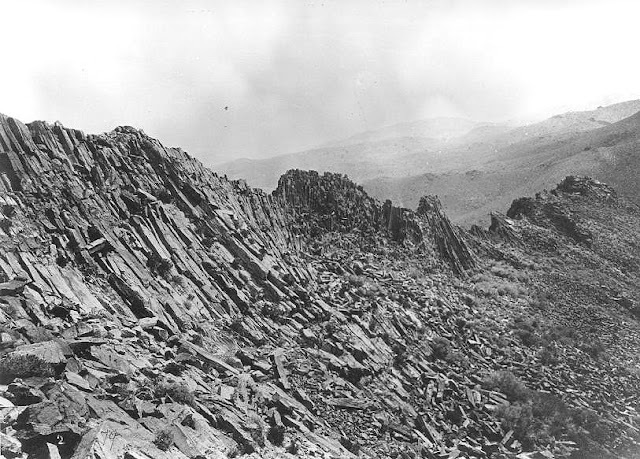 4, 1978), where it was identified as being the “Spectacular Karnak Ridge” in the Trinity Range near Lovelock, Nevada. For years I had wondered where it was. There is no “Karnak Ridge” on topographical maps of the Trinity Range. 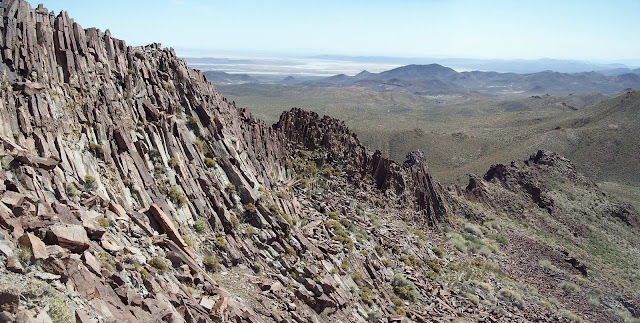 On a hike in the mid-1990s to Ragged Top Mountain at the southern end of the Trinity Range, Â J., R., and I found some similar rhyolite columns, but nothing as extensive as in the etching. Our recent hike to Trinity Peak, at the northern end of the Trinity Range, sparked interest anew in finding Karnak Ridge. A GoogleEarth search of the Trinity Range produced nothing definitive, the resolution is too low in that remote area. But M. tracked down the original 1867 O’Sullivan photograph, shown below. He also discovered the Rephotographic Project, which retraced O’Sullivan’s route to photograph exactly the same locations, including Karnak Ridge in 1979 (second view) and 1998 (third view). Although neither the online version of the new Rephotographic Project nor the beautiful printed book gives location coordinates, it turns out the cd-rom disk accompanying the book does. So now we had the coordinates, UTM Zone 11 4432633 N 0349509, about a mile southeast of Ragged Top. We decided on a cross country route from the north, heading up to Ragged Top Mountain first and then toward Karnak Ridge. It was a bit of a challenge to find the exact spot where the 1867 photograph was taken, but we eventually did. Our dinky digital cameras don’t have the same huge field of view, but the final result after autostitching two images is shown below and in these comparison images. If you look carefully, you can see one or two rhyolite columns have tumbled away and a little difference in vegetation. Otherwise, not much has changed in 142 years. 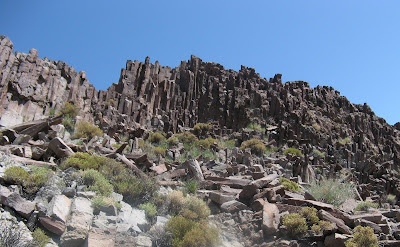 The columns of rhyolite are square to hexagonal, mostly 4″ to 8″ wide and up to 8 feet long. They are formed when molten rock of volcanic origin cools on the top surface, forming cracks like on a dried up mud puddle. The cracks initiate vertical fractures along the crystal planes of the rock. Directions: Take the Toulon exit from I-80, then head west on a dirt/gravel road to UTM coordinates Zone 11 4436756 North 0348305 East, 8 miles from I-80, where a 4wd drive road heads south. We parked after 0.5 mile on the 4WD road, where it crosses a pipeline, it deteriorates after that. The road heads to nowhere on a very steep slope, probably an old mining site. Leave the road to head up the easiest-looking ridge to Ragged Top, still a steep climb in places.